The “Dognose” pattern was made in England ca. 1695-1715 during the period when the Britannia, or 95.84%, purity standard was used (1697-1720), and serving as a style that transitions from the trefid to Hanoverian; it was seldom seen after 1720. 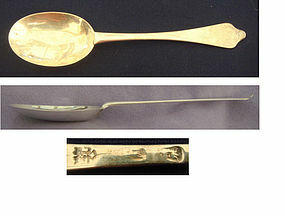 Typical of the Queen Anne style, the handle of this spoon has an upturned terminal which is characterized by a “wavy end” resembling a dog's nose when viewed from above. Attachment to the oval bowl is by a reeded rattail which has softened through the 300 + years of its life and reflects polishing wear, but the overall condition is quite good. There is an appropriate scratched monogram on the back of the terminal, TE. The hallmarks – Britannia, Lion's Head Erased, are only fair but discernible with a glass and a book, but the maker John Broake is clear. (Broake's entry to the London Goldsmiths Company is uncertain, but surely by 1699.) The date mark is rubbed, and I've variously assigned 1698, 1704, 1712 and perhaps others – you decide! Length is 7-1/16 in., weight is 44 g.